Welcome to the Garden Bloggers’ Book Club Virtual Meeting post for July 2008. Don’t you just love virtual meetings? You pick your own time, place, and refreshments. If it was evening and you did happen to be here, you could run out and see my vegetable garden as the sun sets. 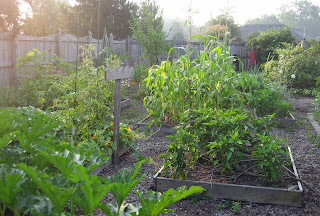 Or if you prefer morning, let’s make it brunch, and you could see the vegetable garden here at May Dreams Gardens before the heat zaps the squash leaves, causing them to wilt each day by noon. But it’s no problem, they perk up again by morning. If they don’t, it’s time to water. 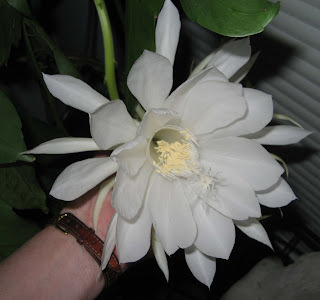 Or we could pretend that the virtual meeting occurred on the same night that the night blooming cereus (Epiphyllum oxypetalum) bloomed. It actually did bloom a few nights ago, and I posted some pictures of it on Twitter. I’ll post more on that event at a later time. Shall we get down to club business, the discussion of our primary selection, People with Dirty Hands: The Passion for Gardening by Robin Chotzinoff? As always before reading the various reviews and related posts, we’ll start out with some background information. It’s really helpful when the author has her own website. You can find out more about Robin on her website, then you can check out her blog, People With Dirty Hands where she “bares her soil” and writes occasional posts about her own gardening and other gardeners she’s met. From there you might also click over and enjoy her other blog Letters to My Agent. Before we go on, show of hands, are you finding it difficult to go to all the links and come back here for more? May I suggest you right click on each hyperlink, select, “open in new window” and then you can close that new window when you are done reading and you’ll be right back here in “the meeting”. Several of us were fortunate enough to meet Robin for a few minutes at the spring fling, when she dropped by Pam’s house during the social hour. Dang! Wouldn’t you know it, I talked to Robin for a few minutes, but I didn’t have my book there to get it autographed, plus it didn’t register with me until later that she was the author of People with Dirty Hands. But it was fun to meet her anyway. So with that background and helpful instructions, I think we’re ready to dive right in and read these posts with thoughts and reviews of the book, People With Dirty Hands. Pam at Digging read the book while she was a big road trip this summer. Mr. McGregor’s Daughter is fascinated by the hot peppers. Cindy from My Corner of Katy shares some of her favorite passages from the book. Kathy at Cold Climate Gardening writes about how fun it is to read about people who are also crazy about gardening. Carol at May Dreams Gardens asks the questions “what is it about gardeners”? Melissa at Garden Portraits, a native New Yorker like Robin also offers a review. 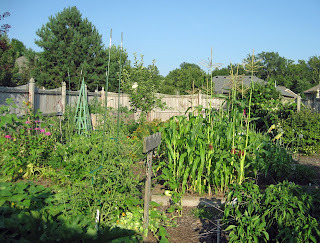 Dee at Red Dirt Rambling writes about her grandmother, her first garden mentor, plus she has another post with an unusual way she looked at the book. Jenny at Life in the Family Patch is new to the book club and wrote about her gardening friend, Sharon. That’s it for this selection of the book club. Everyone take some virtual squash and peppers on your way out, and thank you for joining in! In a week or so, I’ll announce the next selection for the Garden Bloggers’ Book Club. If you have any suggestions, send them my way! Or, if you are an author and you have a gardening book that is of general interest to all gardeners no matter where they garde, let me know, and we might choose it, especially if you’ll post along with us! And finally, if you were planning to join in this month but just didn’t get your post written in time, let me know when you have posted, and I’ll happily add a link for you to this post. Thanks for the virtual peppers and squash. (My squash plant -- the one that is growing up over the top and along deck rail is one of the most amusing plants I have this year). Funny, I had never heard of this book until today and suddenly, it seems a lot of people are talking about it.